The Malaya and British Borneo dollar (known as the ringgit in Malay, Jawi: ) was the currency of Malaya, Singapore, Sarawak, British North Borneo and Brunei from 1953 to 1967. 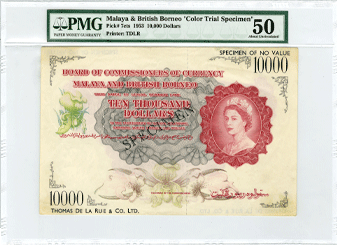 On January 1, 1952, the Board of Commissioners of Currency Malaya and British Borneo came into existence. Notes and coins bearing the portraits of Queen Elizabeth II were issued at that time. Prior to that, notes and coins were issued by the Board of Commissioners of Currency Malaya and carried the portraits of King George VI. On the obverse of the $10,000 multi-colored note is a portrait of Queen Elizabeth II, orchid illustrations and a guilloche in the background. The printer’s name – Thomas De La Rue & Co. LTD – also appears. The reverse of the note features state emblems of the Federation of Malaya and its constituent components, Singapore, Sabah, Sarawak and Brunei. To safeguard against forgery a broken security thread and the watermark of a lion’s head were incorporated into the paper before printing. This 1953 note is a specimen note submitted by Thomas De La Rue & Co. LTD which received the contract and was the printer of the issued note. 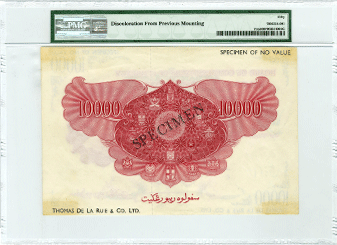 Although this color trial specimen is red, the note was ultimately issued in green.